O2 MSM Roll On Topical Relief Therapy is a proprietary joint, muscle and skin serum gel that is incredibly rich in soothing, pain-relieving and anti-inflammatory botanicals and minerals, along with O2 Activated Oxygen to support the essential health of the tissues. 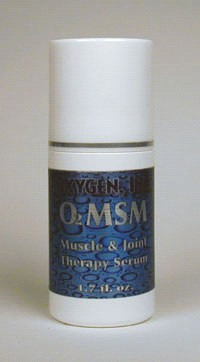 O2 MSM Roll On helps relieve pain and soothes the skin, as well as providing what the tissues need to accelerate the healing process. Also contains methylsulfonylmethane (MSM), whole leaf aloe vera, glucosamine chamomile, willow bark, emu oil, methyl salicylate (98%), Capsicum oleoresin and chondroitin sulfate. Retail: $19.95, 2 fl oz. Copyright OxygenInc Store. All Rights Reserved. Build Your Online Store with 3DCart.